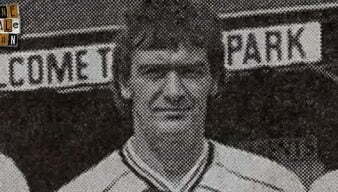 Andy Jones was a successful Port Vale striker who was signed from non-league Rhyl. 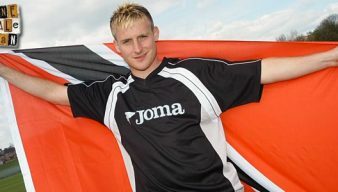 His goalscoring exploits earned him a call-up to the Wales International side and a big money move to Charlton Athletic. A (very) brief clip of striker Andy Jones scoring his debut goal for Wales against Finland in 1987. 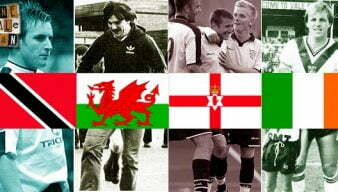 Photos of past and present Vale stars in International action including Steve Guppy, Neville Southall and the club’s first-ever International player. 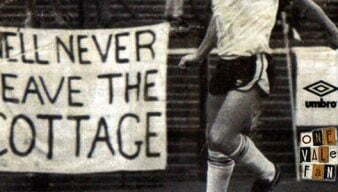 A dramatic last-minute winner by substitute Andy Jones secures a victory for Port Vale during their 1988-1989 promotion season. Our thanks to Andrew White for providing this clip. 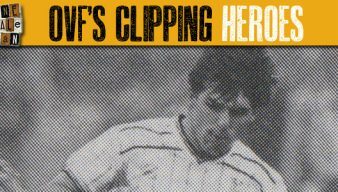 Here’s a clip of one of the eight goals scored in Internationals by Vale players – and this one is by OVF’s favourite player Andy Jones. Following Chris Birchall’s International retirement, OVF takes a look at the select group of Port Vale players to represent their country. 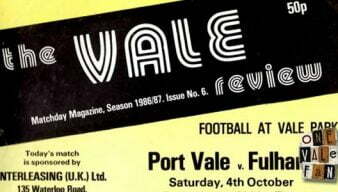 We look back at a famous Vale victory at Craven Cottage by leafing through the match programme. Was Ally Brown a washed-up veteran striker at the end of his career – or did he still have something to offer?